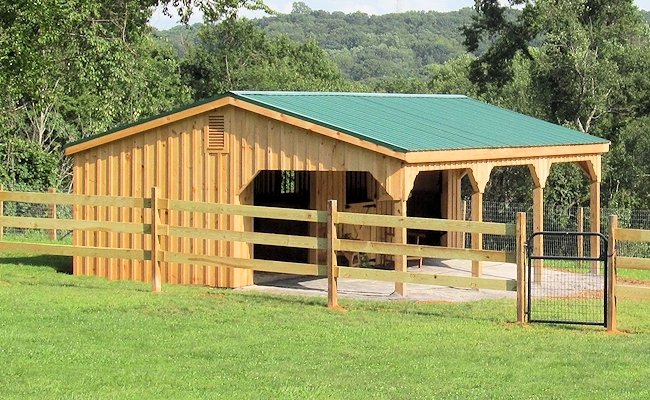 A Lean-to Shed is built by adding large front overhang to any of our Run-In Sheds or Shedrow Barns. 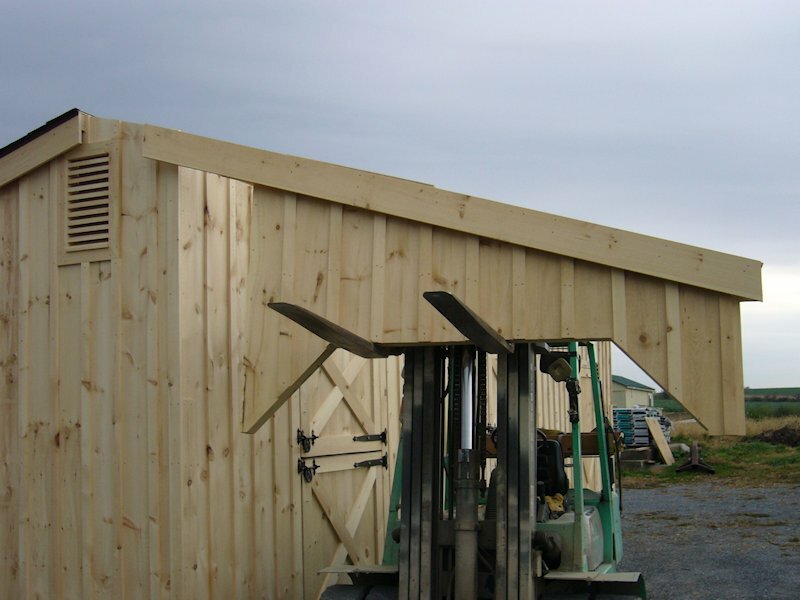 Bigger overhang will help you to keep your stalls drier and cleaner, will act as a run in area for your horses and will also give you a better protection from the rain, snow or the summer's heat. In addition, part, or all of the barn's overhang may be enclosed to provide even more usable area or shelter. 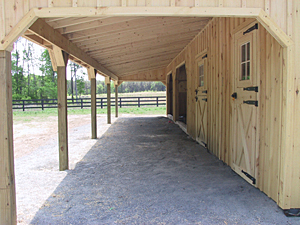 By completely enclosing an overhang, the barn may also be converted into a "Side Aisle Barn" with one side (overhang side) being completely empty with sliding door at each end to make a side aisle, and the other side (stall side) having stalls, wash stall, tack room, or any other room needed. 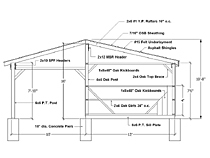 When barn with an overhang is ordered, we strongly recommend to place such barn on concrete foundation. In most cases foundation made of concrete pillars is used as a more affordable solution. 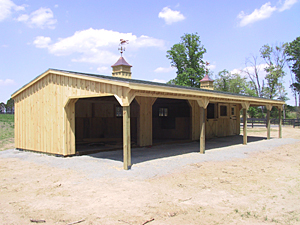 Concrete pillar (sona tube with concrete) is placed under each barn corner and under each partition corner to provide a sufficient support for your barn. 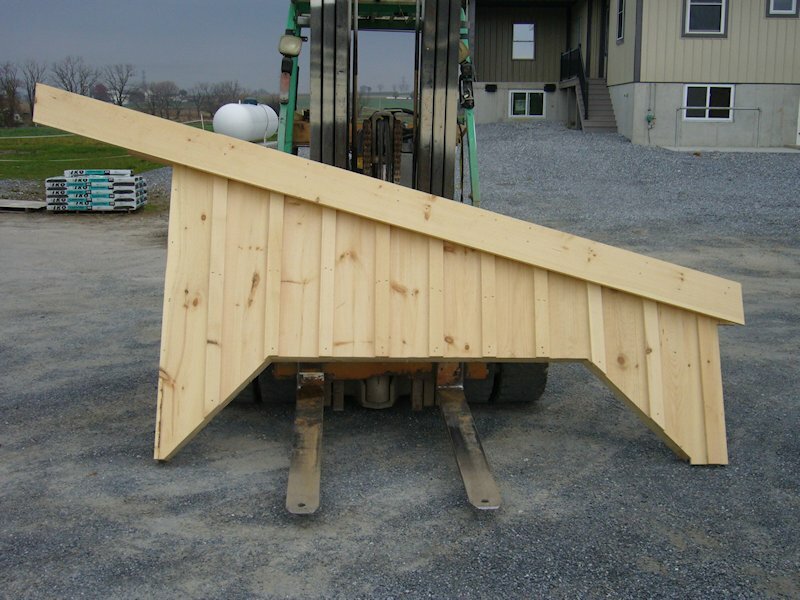 If you, or your contractor will be doing the foundation, we will provide a detailed foundation layout and all the specifications when your barn is ordered. Or, you can hire our contractor to prepare pad and foundation - Please see SITE PREPARATION for more info. 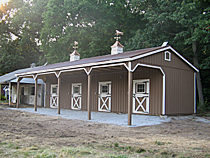 Image of a 10'x32' horse barn with 10' wide lean-to overhang. 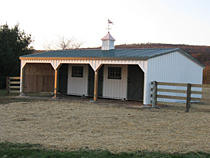 This barn has two 10'x12' run-ins and one 10'x8' storage room in the center. Shown with optional metal roof and gable vents. Our Lean-to Horse Barns are delivered with partially assembled overhangs. Assebled parts include: roof gables and headers. The rest of the overhang such as poles, rafters, roofing, etc. 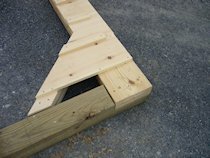 must be built on site. We do offer assembly service, however assembly price depends on travel distance and overhang size. Responsibility of a customer is to prepare site, foundation, drill holes for lean-to poles and then anchor barn to foundation.